1Broker is a social trading platform that allows Bitcoin users to participate in real-world markets directly with their Bitcoins. But 1Broker is more than just a regular trading platform. You can socialize and exchange your ideas and thoughts by commenting on trades you can share with the community. 1Broker currently offer trading more than 40 selected commodity, stock, index, and forex markets. There are no conversions to fiat currencies like U.S. Dollars necessary, you can trade directly with bitcoin. The platform is a great tool for newbies in the trading industry as with their copy traders approach inexperienced traders can get started and make some profit. At the same time, followers can also help the copied traders earning some extra money. 1Broker.com is operated by 1pool Lltd, which is an innovative corporation within the cryptocurrency environment. They serve more than 20000 customers world wide. The first impressions of the site are very good, they use SSL to secure the information you send or get through the site privately. They also offer Two-Factor authentication which provides, even more, safety for the account. 1Brokers dedicated servers are located in a European data center which is protected by security guards and 24/7 video recording to avoid any unauthorized interference with the data stored on their platform. All your data will be encrypted and they are making backups automatically to various locations. Creating an account is fairly easy. After typing in your favorite username-password combo, and adding your email address, you get a confirmation email and you are ready to start. No need to go through a lengthy verification process of the account. On 1Broker.com you can only deposit and withdraw using Bitcoin. Deposits require two network confirmations on the blockchain, this is less than the industry standard of 6 confirmation and this usually takes between 10-40 minutes. After deposit which can be done by QR code or bitcoin address you can start trading right away. Depositing bitcoin amounts to the accounts is free of charge. Withdrawing trading results from your account are also very easy, you only need your bitcoin address set and type in how much you want to send and they automatically send the money to your favorite wallet. You only need to pay the transaction fee due to the miners to verify the transaction on the blockchain and an additional withdrawal fee. The price of to be part of the community is free. You don’t need to pay for account creation, real time market feeds, or even for deposit. Although the fee for bitcoin withdrawal is 0.0015 BTC and the minimum amount is 0.002 BTC to be withdrawn from the platform. Copy traders fee is 2% but it is only applicable to profitable copied positions and is deducted as a percentage of the profit. There are minimum margins to open an order or copy a trader which is 0.001 BTC. There is an ability for overnight financing, but there is a 0.02% fee for long positions and 0.0077% for short positions. On the first page, you will immediately see the most popular and the most successful traders. Clicking on a trader will reveal more information about a trader’s recent activity. Detailed statistics provide interesting insights into the actions of other traders, such as the performance from this month, rewards earned by the copiers and the volume of the copy traders. The performance chart shows how the last 12 month the user was trading. Each user has a risk number indicating the percent of profit/loss of open position changes done by the user. Risk 1 is very low risk, meaning The profit/loss of open positions changes by less than 2% per day on average. Risk 5 indicates very high risk meaning the positions changed more than 16% on average per day. Another chart shows how the trades were distributed between the different markets and assets. The main feature of the site is the ability to copy other users making you able to profit from their profitable trading ideas. You can copy successful traders with a fixed amount per trade of money. The creator of a trade will have full control over the Stop Loss/Take Profit price and can decide when to close the position. However, you can manually close a copied position at any time as well if you want. Make sure you get enough information before you start copying other traders that they have enough experience and you should only risk what you can afford to lose. The Forex trading includes more than 20 well-known currencies to trade. In the stock exchange, you can make profit on the price changes of the biggest companies like Alphabet, Facebook, or even Apple. Indices include Dow Jones, DAX, NASDAQ and much more. Unfortunately BTC/USD market was recently closed and will be replaced with a new dedicated trading platform for cryptocurrencies that is expected to launch in Q3 2017. When you open or close a position using a Market order, your position will be executed immediately at the best available price on the order books. This is the simplest order type which does not require any parameters. With the live chart, you can track your investments profit any time. A Limit order makes it possible to set the price at which you want to open a position. This limit price should be lower than the current price for long positions and higher for short positions. A Stop Entry order is an order to open a position once the market hits a specified price. Contrary to Limit orders the „stop entry price“ should be higher than the current price for long positions and lower for short positions. The graph can be set to live, hourly, daily, weekly or yearly refresh rate depending on the type of trade you want to make. Only shared trades are publicly visible and will be automatically copied by your followers. This can be done by checking the share trade checkbox. This sets your trade to be available for others to copy making you the trade owner receive 1.5% of the generated profits and 2% of the profit is charged from the copiers. For copy trades, the minimum trade amount is 0.25 BTC. This ensures that a malicious user cannot make risk-free trades while putting the funds of the copiers in danger. With trading ideas, you can make comments in respect of an actual trade. You can ask any question about it and the trader will make every effort to help you. Comments are a good way to get information about an actual trading pair and what people think about the future price of it. 1Broker.com lets you trade with traditional assets (forex, stocks, indices) directly with bitcoins. The platform also has an extra feature, the copy trading option to follow experienced traders and make profits from their trade ideas. 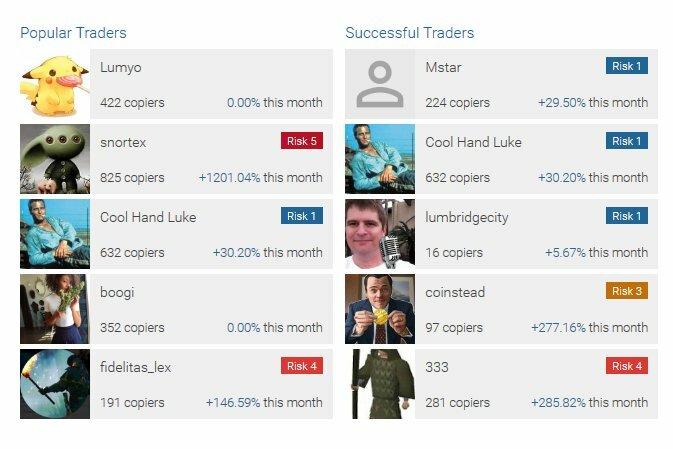 Copied traders can earn extra money by being followed while newbies can be exposed to the market with the help of more experienced traders. The social community behind the platform is open to share and discuss trading ideas. 1Broker.com has low fees, only copy trading, margins and withdrawals are charged. They use security features to make sure the data stored on the platform is securely handled.